In this post I’m going to touch on some new experimental/optional rules ideas for using irregular forces in Chain of Command. I think Irregular force types need to be handled in a distinct way in Chain of Command to better reflect their temperate and motivations.The sorts of troops that would fall into this category for WW2 are most obviously Partisan forces and also Resistance fighters. Some of these troops could perhaps be treated as Green, Command Dice 4 troops but really this just makes them very bad military forces, which to my mind they are not. They behave differently because they haven’t been through the process of militarisation which by its nature is aimed at overcoming the ‘bad traits’ that make irregular forces unreliable in a military sense. They’re also motivated and react in different ways to regular forces, sometimes the same, often times not. Military training attempts to integrate and overcome these traits, but irregulars never really do as they may exhibit unexpected tenacity or brittle cohesion….mostly it’s an unknown quantity until the day of battle….which really is the problem to start with. Despite this lack of formal military training, the bonds of local personalities, culture, politics and religion all come together in varying combinations to motivate irregular forces to fight. Chain of Command fundamentally focuses on ‘same-type’ troops who differ mostly in structure and to a degree organisational and cultural influences i.e. esprit de corps. The military process of discipline and training is designed to overcome the stress of battle and thus allow the application of force to achieve a successful outcome to an engagement. Essentially these armies are using the same basis of psychology to combine equipment, training and leadership to determine the winner and loser in these confrontations…mostly leadership. Irregular warfare forces do not follow the process of militarisation described above. Their ‘strength’ in fighting derives from their tribal or clan bonds, their commitment to their cause, immediate community and experience in warfighting. Combined, these assets can produce determined and tough fighters. Conversely the lack of formal discipline and to a degree personal accountability or ‘group risk’ usually makes irregular forces skittish when the test of combat is applied. The result can cause the motivation and morale of irregular troops to be less than stable under pressure. To that end the following ideas provide a different way to use the current mechanisms in Chain of Command to reflect some of these qualities. Two new ideas are used to produce the ‘unstable’ nature of irregular forces – they are motivation and outcome driven shock effects. In Chain of Command the accumulation of shock causes a unit to deteriorate by becoming pinned and ultimately broken when enough ‘shock pressure’ is applied. We change this for Irregular forces. When units are fired at shock and losses are used to determine a unit’s morale reaction, rather than tracking ‘actual shock’ to incrementally record a unit’s current state ie Irregular forces do not keep track of shock! When irregulars are fired at we use ‘resultant’ shock and kills (which count as ‘two shock’) to trigger a test to determine an outcome…that’s all. The factors used to determine the outcome are linked to unit size and the command dice number (4,5,6) of the irregular unit when determining whether a unit either shrugs of the ‘shock’ of fire, becomes Pinned or is Broken…so no build up of shock…just an outcome from being fired at….very fast, very simple. The effects of fire also determine the amount of firepower an irregular unit puts out. Because of the way units move from being in a ‘good’ state to pinned, the fire reduction is accounted for in the determination of whether the unit is pinned or not…it gives more of a group feel rather than an incremental individual feel (which tracking shock provides). Because Pinned reduces fire by 50% this was taken to be the point where most of the group didn’t commit to the fight and thus their firepower dropped significantly. It also removed the need for any monitoring of unit ‘fire condition’..much simpler and cleaner. You might think that quality would be a better determinant of fire outcome instead of Command Dice, however quality is already accounted for in the firing stage of the calculation. Command Dice in Chain of Command reflects (amongst other things) the soft factor command and control ability of a force, training, resilience and cohesion, and this when combined with the quality and size of the unit gives a better overall ‘test’ of a unit’s reaction to combat stress. In concert with that a level of shock/losses allows a certain threshold of pain to be reached before this test is even triggered. This produces very fast fire result determination outcomes – you remove casualties and quickly proceed to the outcome table….ok…pinned…broken…that’s all! A nice side benefit of this is that handling larger irregular forces is possible as the ‘micro management’ of shock does not apply to them…this helps speed play. Some African militias would be good candidates for using Irregular Warfare rules. Now, we couple the outcome based shock effect with the new concept of Motivation. This accounts for the willingness (or wellness) of the psyche of the irregular force as a whole based on the battlefield events that occur throughout a game….you know the idea…guns waving in the air…”lets get ’em” or “this is not going to well, let’s hit the dirt and see what happens next”. The idea of motivation is that the events on the force morale table cause an irregular force to become motivated. There are three stages of increasing (committed, motivated, highly motivated) and decreasing (reluctant, unmotivated, wavering) motivation. This motivation effect applies to the entire force, though individual units and events cause it to fluctuate. Each period or scenario can have motivation effected by certain situation, such as irregular troops being attacked by aircraft (which they generally do not like). Alternatively the seizing of an objective may increase morale as well…flag on the top of a building type of idea. When the motivation is at its highest level this drives units to become Aggressive. At the bottom end of motivation this reduces their combat capability. This motivation can go up and down and if a Turn ends (i.e. a break in the action occurs) then the motivation is reset to neutral as the bloodlust or fear dissipates in the pause in activity. This makes irregulars feel and react quite differently to the regular forces with their structures of leaders to lift of shock and manage battle psychology more effectively instead of it being somewhat more random than those of the ill-disciplined irregular fighter. Irregulars can move quickly from feeling fine to routing and even back again in relatively short order. Such a system can have a lot application to theatres of conflict beyond the Second World War. It can be used for many guerrilla armies in Africa, conflicts involving Arab Militias, indeed armies of the colonial era to a degree, such as NW Frontier Afghans as well of force of the interwar era such as the People’s Militias of the Spanish Civil War or Riffian tribesmen of Morocco. 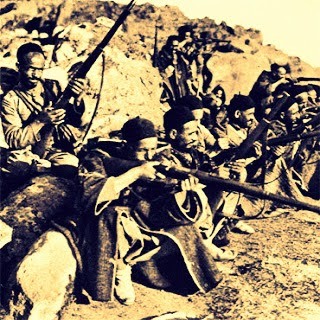 With the above in mind we shall explore these ideas by pitting a regular European army against some irregular fighters – in this case our after action report will detail a clash set during the Rif War, fought between Spain and the Riffian forces of Abd-el-Krim sometime in the mid 1920s in Morocco. …from cover, using aimed fire and together! 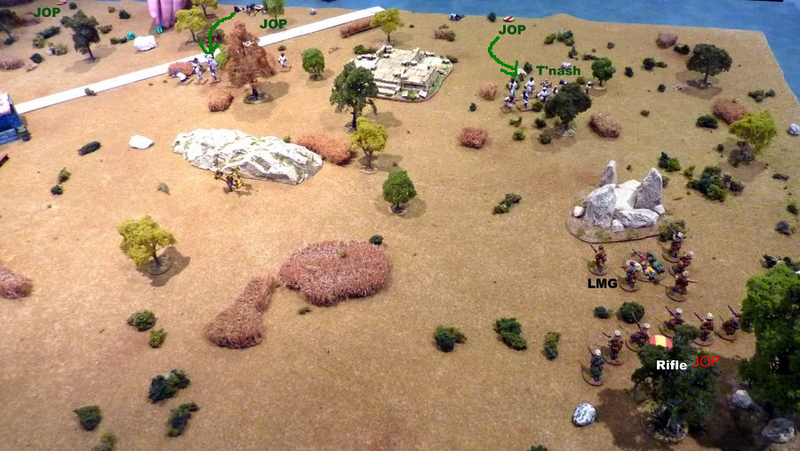 In this scenario a Spanish force is patrolling near an abandoned outpost known to be frequented by Riffian irregular forces for water from a local well. The encounter was the Patrol scenario from Chain of Command rulebook. The Riffian troops consist of an Arab Harka at slightly reduced strength commanded by a local Harka Caid (senior leader in CoC) in charge of two Hamsain-u-asheen (large sections) each led by a Caid (junior leader) with two 10 man T’nash units (squads), one with a flag bearer. In support of this force was a unit of 10 cavalry and a captured M1915 Hotchkiss MMG. Rated Green, Command Dice 5, for this encounter they had Force Morale 8. The Spanish had a typical platoon of Moroccan Regulares, North African troops in the pay of the Spanish realm. This was made up of two Section of three 6 man squads. Two LMGs were taken as support options from the Regulares MG platoon, one attached to each section. Rated Regular, Command Dice 6, for this encounter they had Force Morale 8. Both sides jockeyed for position a fair bit. As there was little cover to hide behind in the end the Jump Off Points (JOPs) for both sides ended up on their baseline, except one Spanish JOP which was in a nearby wood. Here you can see the two Arab T’nash moving off from their JOPs as the initial Spanish troops, (two squads) emerge from the wood. 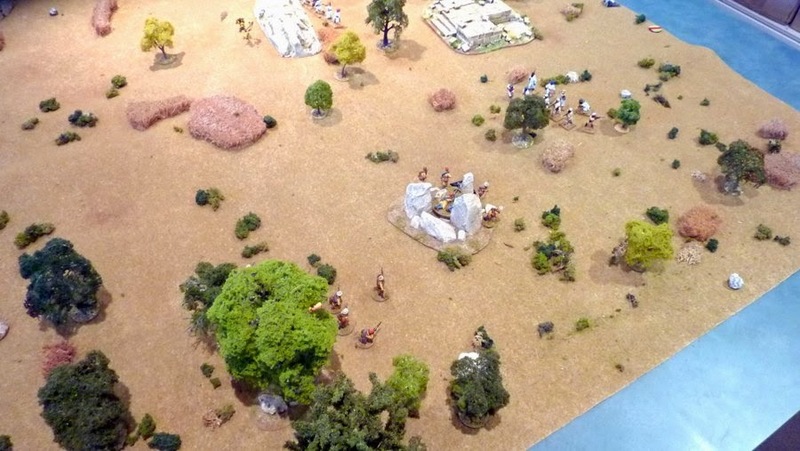 The game commenced with the Rif deploying two T’nash and moving toward the rocky outcrop in the centre of the table and past the Roman ruin. The Riffian player got a double phase and pushed up quickly. Using their ‘stealthy’ ability they are able to move 2D6 and still remain in a tactical stance (as can the Spanish Regulares). This mode of movement is pretty standard for both sides as the troops used every bit of ‘cover’ to advance to their advantage. The Riffian troops quickly advanced to try and get the Spanish in a cross fire once the initial Spanish deployment out of the wood became obvious. 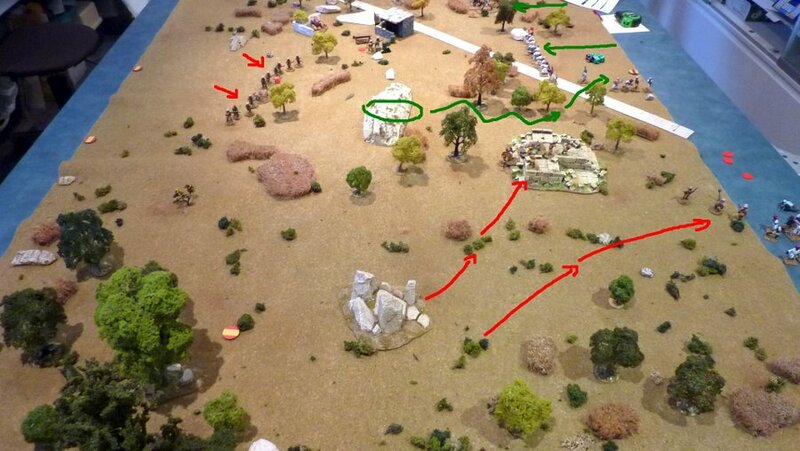 As often happens in Chain of Command the action focused on a particular section of the table and the troops tried to move as quickly as possible to make use of every bit of ‘real cover’ on table as they could. For the Regulares this involved pushing up into a rocky outcrop so they could set up a base of fire from that location. The Riffians successfully moved up and occupied the central rocky outcrop and positioned themselves in a tactical stance just to the front of the Regulares LMG squad nestled in the rocks to their front. The second Regulares squad was delayed as all effort was placed to ensure that the first squad made it to the rocks and prevent the Rif from occupying this critical bit of terrain. A general firefight commenced with some hot dice rolling by the Regulares LMG squad who also had the benefit of being able to go ‘tactical’ and ensconce themselves in the rocks…essentially putting him them in hard cover. Both sides have gone tactical as the second Regulares squad moves up. 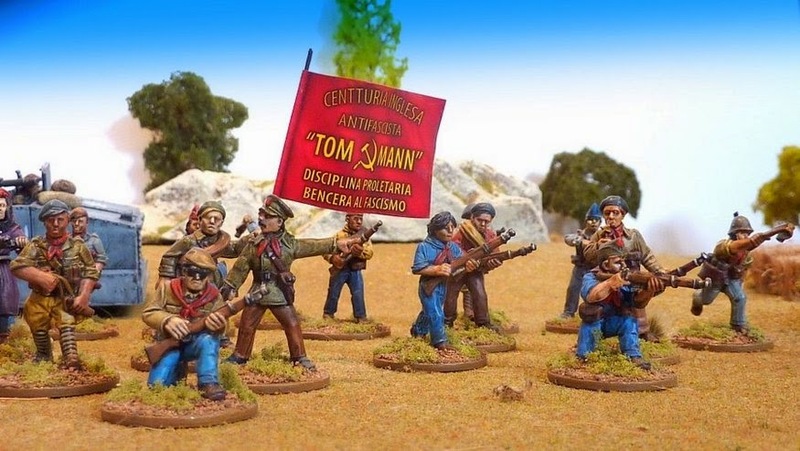 The Spanish commander then pushed up his second squad as the Rif firmly set their fire positions, the left hand T’nash in tactical mode and the other T’nash now settled into the central rocky outcrop. These on table deployments came at the expense of any other Rif forces deploying though the Riffian commander was clicking up his Chain of Command dice with several rolls of 5. Whilst limiting his movement the Chain of Command dice build up was quite the thing the irregular Rif force commander was looking to get so it wasn’t all bad. …a worrying cross fire for the Rif player to contend with, as the second Spanish Regulares section emerges on their flank. 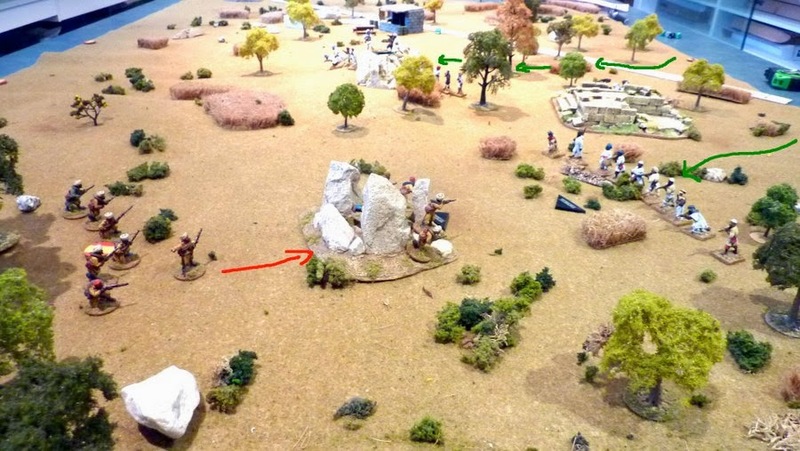 The Rif player now needed to determine whether to keep up concentrated fire on the Regulares LMG squad in the rocks or turn to counter the newly arrived Spanish troops. Whilst outnumbered, he would be in hard cover so could hold his own until reinforcements arrived. 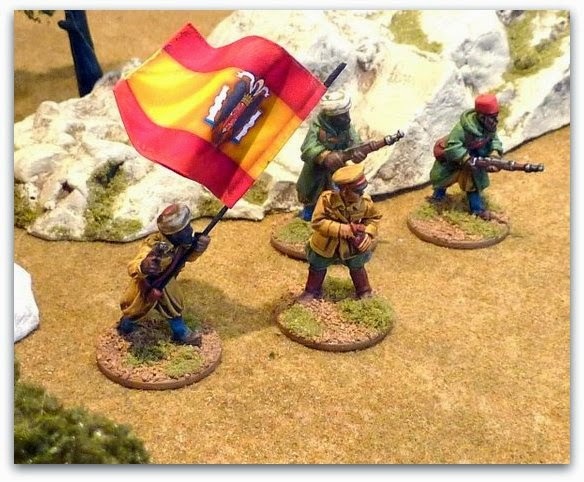 Still the Rif commander had not deployed in his other T’nash and the Spanish took the opportunity to push up their forces as much as possible. The Riffian commander had by this time built up a Chain of Command dice and was starting on another, so he did have a number of options available to him as the Spanish commander had yet to build a Chain of Command dice. 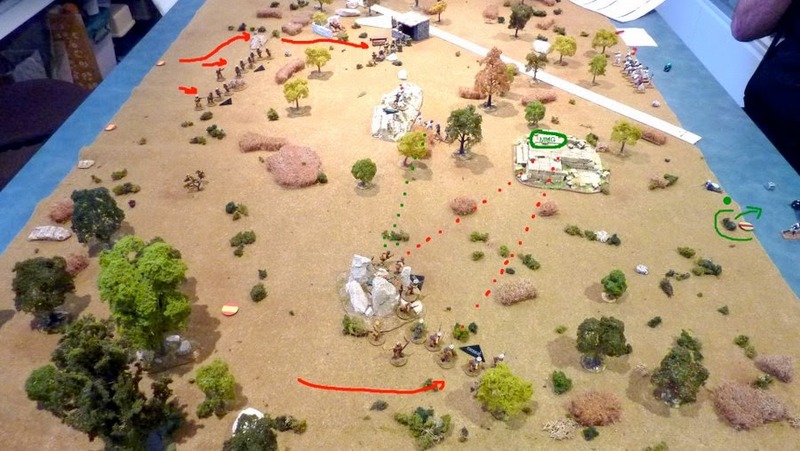 Nevertheless, out of the wood emerged the third squad of the 1st Section of Regulares completing the deployment in that location for the Spanish player. This would give the Spanish a local manpower and firepower advantage and the Riffian commander needed to counter this development. Similarly the placement of a T’nash in the central rocky outcrop exposed the troops to the incoming 2nd Regulares squad, even though they were in a Tactical stance which certainly made them harder to inflict damage upon. Deploying and firing at the same time the Rif T’nash took a good deal of fire from the incoming Regulares, (receiving four shock) which triggered the first test on the Irregular Fire & Combat result table which the unit passed, suffering no ill effects. The first Rif T’nash routs, having failed its fire outcome test. Seeing he needed to counter the build up of force on his left flank, the Riffian commander pushed up some fire support. Deploying his medium machine gun team and moving it as quickly as possible to take up a fire position in the ruin. Hopefully the longer range of the tripod weapon would allow it to dominate the ground to its front and break up the Regulares LMG squad in the rocks. All attention was now focused on the left hand flank as the Riffian commander desperately tried to achieve a fire ascendancy and take out a Spanish unit. Whilst this concerted action might have drawn him away from deploying in further units, the ‘local victory’ he was after would increase the motivation of his force and stiffen the resolve of his men, allowing them to gain a benefit in any subsequent fire or combat outcome tests they would have to undertake….so this necessity (as he saw it) to motivate his troops was at this point affecting his battle plan, or at the very least, his battle management. This is an important point any irregular force commander must always keep in mind i.e. the temperament of his men and achieving success to keep their motivation levels high, or at least neutral assn counter adverse effects as well. Negative motivation effects (units and leaders lost), can severely effect the resilience of an irregular force’s resolve. The battle became general at this point. All of the Spanish troops had been deployed and the action was heavily focused on the struggle around the rocky outcrops. This generated a lot of shooting. The Spanish LMG squad, firmly entrenched in the rocks, were hard to hit. They took a few shock from the fire of the two T’nash they were engaged with but it was not enough. By this stage the Spanish platoon commander (Senior Leader) had emerged in that location, where his presence greatly assisted with command and control responsibilities, primarily with the removal of shock received. As a result the Riffian T’nash were getting the worst of it. The Regulares LMG squad unleashed a hail of fire into the lead enemy unit and it suffered heavy losses. Already having lost 3 men in the previous fire fights, for which it was able to shrug off the effect of fire, it now suffered a further three casualties, in addition the fire wounded the Caid (junior leader) and caused a drop in force morale of 1 point and reduction in motivation because the leader was wounded. These losses triggered another check on the fire outcome table. By way of example we can see how this table works. The unit was at the time of testing reduced to a small size, with its force having Command Dice 5 (CD5). Cross referencing the table the Rif player rolled a 2, which resulted in a Broken result. This caused the unit to Rout from the effect of fire – note, no shock is marked on the unit, only the outcome from the fire is conducted. By this stage the Riffian forces had suffered a serious, but not catastrophic reverse. The effect of the T’nash routing was to further reduce the Motivation of the Riffians by another stage from Reluctant to Unmotivated. Thus any further test required would suffer a -1 morale penalty on the Fire and Combat outcome table until a better motivation level could be restored. A -1 to an outcome test is a significant shift and the Riffian player would need to address this in short order. He had two options open to him – achieve a success of his own or ‘end the turn’ (which returns the irregular motivation to neutral). He would now need to start to consider these options more importantly as part of battle management as another reduction in motivation could result in a collapse of his entire force if the Spanish player pushed his advantage and triggered more outcome tests. Adding to his motivation woes, his Force Morale also reduced by 2 points because of a ‘section breaking’. The subsequent few phases saw a seesawing of activity as command dice produced lacklustre opportunities for both sides. The Riffian commander had the serious issue to resolve of a broken unit needing attending to, but also a delicate tactical dilemma of leaving his central T’nash exposed to the fire of the now well placed Spanish forces on his right flank. The Spanish commander continued to pepper effective range fire into the Machine Gun position and fortuitously got three kills (3 6s!) from one phase of fire…that reduced the Riffian MMG to a crew of 1 and the fire slackened off considerably. Miraculously the Riffian MMG team rolled a 6 and held its ground …Lords of the Atlas indeed! The next phase of fire for the Spanish player put an end to the machine gun team for the day as the last man was taken out before it could in any way be recrewed. This caused a force morale test but no morale loss occurred. This meant that the Riffian motivation also didn’t reduce as motivation is only adjusted when force morale changes. However, with his left flank teetering on collapse the Riffian player now used all the advantages in his arsenal. In his next phase he introduced his Caid (Senior Leader) to the location of the broken T’nash. He then proceeded to use the three command initiatives of the leader to restore the unit from broken status…as it turned out he removed both markers (which only irregular forces can do) by rolling two 6s. He needed to do this for two reasons. First, to avail himself of the special ‘Infiltration’ ability of the Riffian forces, a unit must not be broken. 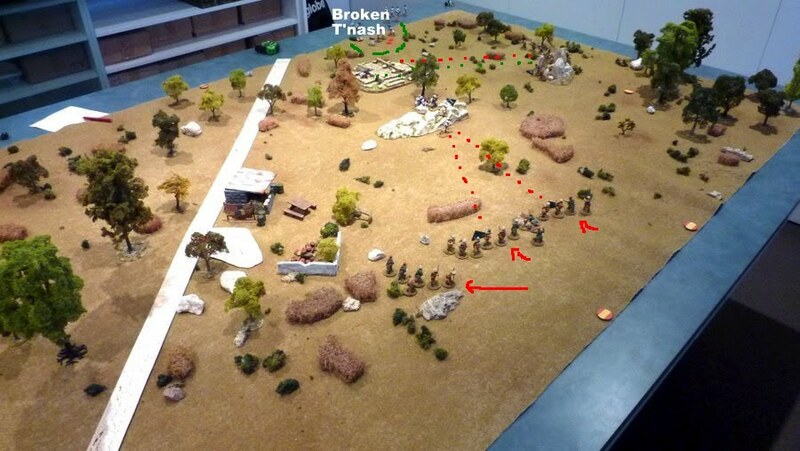 Infiltration allows a unit to be removed from play if out of line of sight of an enemy and beyond 12″ (in the picture you can’t see but there is a small hillock that does break LOS from the Regulares and the broken T’nash). Secondly he can End the Turn and gain the first advantage of a weakened unit begin able to be removed from play, along with any attached leader(s) and critically for him, the motivation of his force returned to neutral…so he removes the two stage of ‘negative’ motivation (as the break in the action settles the nerves of the tribesmen). ….result the once broken unit is withdrawn under the leadership of the Caid and the Harka’s morale is restored. By these actions the Caid has regained a degree of control over the situation….clever tactics! Even though the entire Riffian left flank is ‘open’ to exploitation by the Spanish player the Riffian commander still has his jump off points in that location and can introduce units straight back into the fight….including his cavalry, which if handled properly, could be devastating. See that the T’nash has left the table and the MMG has been destroyed. The Regulares have taken fire also but that strong position amongst the rocks has saved them from the accurate Riffian fire. The next few phase passed between both sides, Regulares advancing whilst a fresh T’nash unit moved on under the eye of the Riffian Harka Caid. The Rif cavalry did not deploy on the left flank as expected, instead, they advanced unhindered on the right attempting what appeared to be a sweep of the Spanish left. If they could make their presence felt in the next few phases they could turn things around for the Rif. Meanwhile a hot fire was kept up on the central Riffian unit, further weakening them as they lost another casualty. Attempting to place himself where needed, the Rif junior Caid moved to support the central unit. 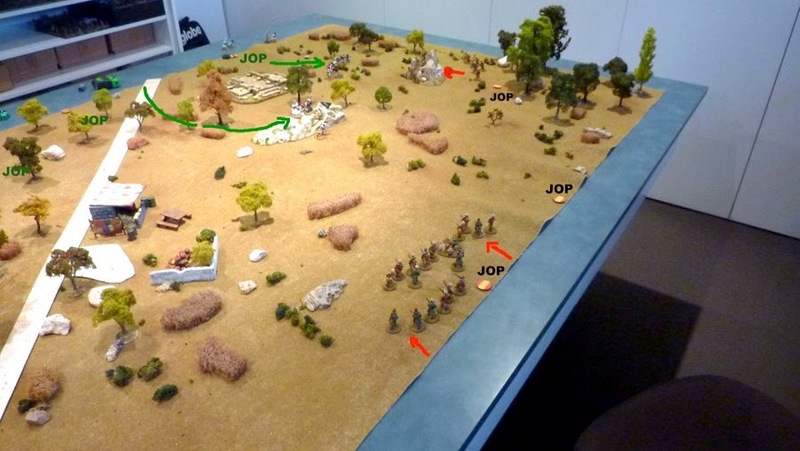 By this stage the Spanish commander realised that he had to push his temporary advantage as much as possible before the Rif cavalry and infantry combined in a pincer movement on his left edge. To his right he advanced his Regulares ‘at the double’ with his LMG squad, supported by the second rifle squad, temporarily commanded by the platoon commander. This movement was aimed at seizing the ruins to establish an enfilade position on the remaining Riffian forces. On his right he ‘doubled’ the second rifle squad with the section leader attached directly at two vulnerable targets. The objects of their attention was a two man Riffian marksmen team, up to this point relatively inconsequential in proceedings, along with a Rif jump off point. If he could take out the sniper and capture the JOP then the Riffian force morale and motivation may very well suffer irrevocably. At the top of the page you can see the Rif cavalry just moving on table, supported by an infantry unit to their left. The Spanish push can be seen with the ruin now occupied and the sniper team snuffed out! In the centre the Spanish second section opened up with a hail of fire on the weakened central Riffian unit. Without knowing it, this blew the lid off the entire Riffian defence. The attached Caid leader was killed outright!…(a roll of 1!). This reduced the force morale by a further 2 points, which left the T’nash leaderless and drove the motivation down to Reluctant yet again….ouch! Because of the casualties an outcome test was triggered.With the T’nash now reduced to a small unit, the hapless Riffian player rolled terribly….a 2….causing the unit to rout! A further two points off the force morale…now down to 2 points. 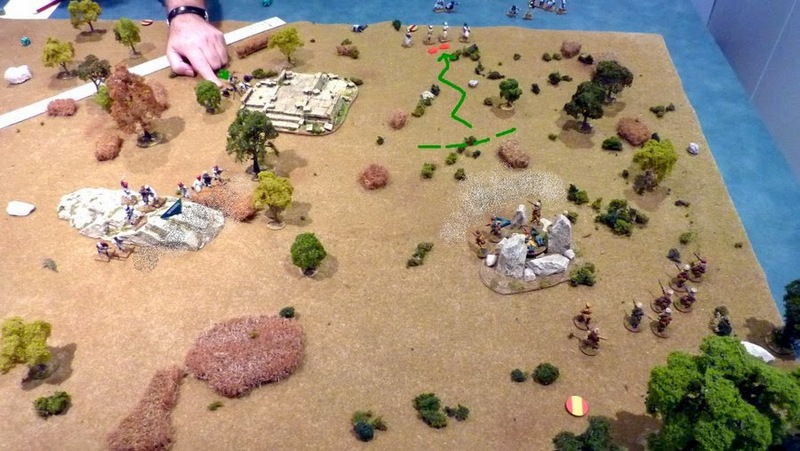 On the right flank the combat between the second rifle squad (5 men) with its attached leader against the two marksmen resulted in the Riffians being eliminated and two Regulares casualties. This wiped out Riffian team fortunately caused no force morale reduction and thus no motivation reduction either. It was all for nought however as the Spanish commander played his Chain of Command dice he’d been husbanding for just such a moment. By declaring an End of Turn, all enemy jump off points overrun and not subsequently retaken are removed from play. With that the Spaniard player took his chances needing a 4, 5 or 6 to inflict a two point force morale reduction on the Riffian force, thus breaking their force morale and ending the game……the luck was with the Regulares today as a score of 6 sealed the fate of the Riffians in this encounter. The purpose of the game was to test out the irregular warfare rules, more so than the individual tactics of one side over another and certainly not the result. So focusing on the Riffian side we can see that a number of points were raised. The first was that the Riffian commander noticed that handling more units would be simpler with this system. Micro managing shock, appropriate for regular structured armies, seems less appropriate for irregular forces. In fact the whole purpose of military organisations is to control shock and irregular tribal organisations do not lend themselves to this ‘controlled’ process. A critical aspect, highlighted several times during play was that irregular motivation is very important. This felt right. Keeping force motivation up is a primary task of an irregular player and the ability of both sides to end a turn and ‘neutralise’ motivation is an important ‘leveller’. Coupled to this ability for a player to end the turn, when playing with an irregular force, the Chain of Command dice is also allowed to counter an ‘end of turn’ play and keep the current turn going thereby keeping force motivation up or down as the case may be. For the specifics of this period the Rif ability to infiltrate and move into and out of play highlighted how useful this tactic can be. It won’t be used often but having a chain of command dice available to do this as the situation allows is very handy. The fluctuating temperament of irregular forces is allowed for by enabling their leader to rally his units, even if a turn hasn’t ended. Thus a unit can be broken (as happened in this game) and recovered totally in a subsequent phase…albeit it require two sixes rolled on two or three dice to do it…a very low chance, though it did occur in this game. Conversly rallying from pinned or routed could take a long time so the erratic nature of irregular forces keeps both the irregular force commander as well as his opponent guessing!! Motivation is something that can be defined through a range of variables. Specific scenarios could cause irregular troop’s motivation to rise or fall and even some scenario events might cause this as well. The examples given before about irregulars being attack by aircraft being a case in point. The list could be made very period specific and would probably be best handled that way. The outcome based morale effect seems far more appropriate for these types of force. Both the player in command of those forces as well as his opponent are more or less unsure of the ‘real state’ of an irregular unit, though the influencing factor of motivation is a critical element. I hope the ideas presented provide food for thought as it provides a very fluid game that in no way effects how the basic game is played, with only minor rules adjustments needed. The rules are still advanced beta test but do seem to work quite well.